Sorry, Capitol Hill. You are so last week. All of a sudden, restaurants and bars (not to mention boutiques and tech companies) are competing for real estate in a new neighborhood. And who would have guessed it would be Pioneer Square. But then the ebb, as restaurateurs and bar owners moved their attention north to Belltown, then on to Fremont and Ballard. Capitol Hill has been the address of choice for the last few years; dozens of high-profile restaurants, bars and shops have revitalized once-scruffy stretches of Pike and Pine streets. It’s a fickle business being the “it” neighborhood, and Pioneer Square has been all but forgotten for at least a decade. During that time, the sports bars along First Avenue continued to thrive, but so did crime. New businesses were scarce. It felt like a death knell when Elliott Bay Book Company, a Pioneer Square cornerstone since 1973, closed and moved to Capitol Hill in 2010. But not everyone shared that point of view. Pioneer Square’s core group of residents fiercely defends the neighborhood. “Those of us who have lived here for a while have always known what a great neighborhood Pioneer Square is. Now it seems like the rest of Seattle is figuring it out,” says Jen Kelly, a marketing executive and Pioneer Square resident who runs the New Pioneer Square blog. Is it ever. Long-vacant Renaissance Revival storefronts along First, Second and Occidental avenues are now being snapped up by businesspeople of all stripes, most notably a growing list of restaurateurs. Leading the way in the culinary world is Matt Dillon. 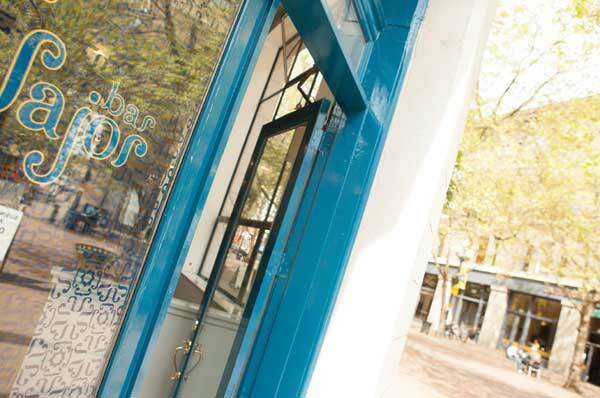 The 2012 James Beard Foundation Award–winning chef and restaurateur owns thriving, stylish restaurants in Georgetown (The Corson Building) and on Capitol Hill (Sitka & Spruce, Bar Ferd’nand, both inside the Melrose Market). 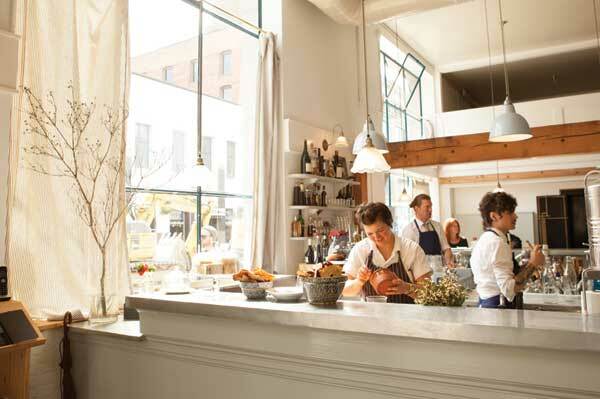 In mid-2012, Dillon announced his plans to open two places in Pioneer Square this year. Dillon’s Bar Sajor (shown above, 323 Occidental Ave.; 206.682.1117; barsajor.com)—pronounced SIGH-or; it’s Dillon’s mother’s maiden name—opened in a corner space on the Occidental pedestrian mall in February. White, bright, airy and chic, the space has high tables with stools, a European stand-and-eat counter, rustic wood tables and a wine-with-lunch air. Seafood—local albacore, Dungeness crab, smelt, anchovies, sardines, salmon—and vegetables cooked in a wood oven are the draw, with most everything given North African and Mediterranean accents. A smart but limited bar program and a primarily French and Italian wine list accent the sophisticated and delicious food. Dillon’s second project, opening across Occidental Square from Bar Sajor this summer, will be called London Plane. Similar to Melrose Market, this larger space at the other end of the Occidental pedestrian mall will be home to Dillon’s long-awaited bakery (his esteemed bread and pastry business has outgrown its borrowed oven at The Corson Building), a second locale of Marigold and Mint (owner Katherine Anderson is also Dillon’s business partner in London Plane), a wine bar and a private event space. Russ Flint opened Rain Shadow Meats Squared (404 Occidental Ave.; 206.467.4845; rainshadowmeats.com), kitty-corner from Bar Sajor, in March. At Squared, Flint’s second butcher shop (his first, Rain Shadow Meats, is in Melrose Market; notice a trend? ), a dizzying lineup of local, grass-fed pork, beef, chicken and house-made charcuterie is for sale, but Squared is roomy enough for eat-in dining; to that end, a tempting menu of charcuterie boards, sandwiches, even salads featuring the shop’s house-cured meats and pâtés is offered. 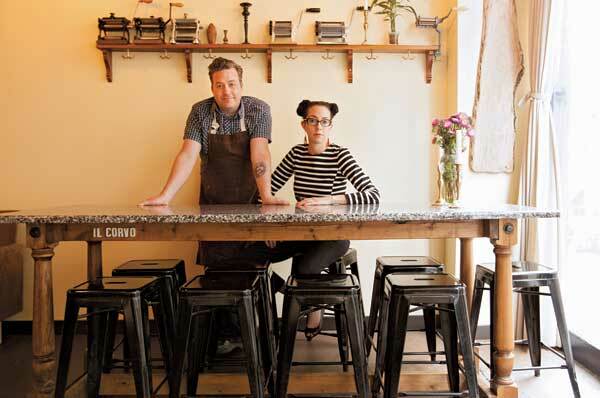 “I’ve always loved Pioneer Square, and always thought it was a great neighborhood for a lunch restaurant,” says Il Corvo owner and chef Mike Easton, who relocated his fanatically adored pasta spot from a tiny shared space inside Procopio Gelato to Pioneer Square in January. A spiffy paint job and rustic mood lighting transformed the former BuiltBurger space (217 James St.; 206.538.0999; ilcorvopasta.com) into an easygoing (you’ll have to get your own fork and water) yet refined (house-cured charcuterie with pickled celery, anyone?) lunch spot. Il Corvo’s short menu changes daily according to Easton’s whim, but trust me when I say you truly cannot go wrong. The pasta is divine, and still always less than $10 a bowl. Above: Mike Easton and his wife, Victoria, happy in Il Corvo, their new Pioneer Square restaurant. Around the corner on Second Avenue, a long-vacant space across from the fire station will soon be home to Tinello (314 Second Ave. S; facebook.com/tinelloseattle), an endeavor from longtime restaurateur Rudy La Valle (of the now-shuttered Rialto Pasta Bar). At press time, La Valle was aiming to open his Italian eatery in June or early July. But the renaissance goes beyond restaurants. Back on First Avenue, E. Smith Mercantile (208 First Ave. S; 206.641.7250; esmithmercantile.com) opened in early April, with an assortment of goods—antiques, housewares, apparel and an apothecary—in the front of the shop, and a small craft cocktail bar in the rear, which will open in August. And we couldn’t really call it a resurgence without a neighborhood farmers’ market, could we? That’s coming, too; a Pike Place Market Express at Occidental Avenue and Main Street on Wednesdays from 10 a.m. to 2 p.m., June 19 through September. And this seems to be just the beginning of the good things coming to the historic neighborhood. With the Viaduct’s demise and an influx of residents soon moving into 900 housing units (thanks to the newly constructed Post Apartments and Stadium Place), as well as a newly redeveloped waterfront, Pioneer Square is hot property once again.